Convention 2011! What an absolute hoot! This is Claire my Melbourne buddy. Well actually she is my buddy where ever she may live!!!! This photo was taken at Manager’s Reception. ………..and what a reception it was. Lovely ladies, sensational food, terrific gifts. Gosh I love my job with SU! I cannot stop being amazed at the difference in this photo and the one taken last convention. I was so ill and in pain last year that it truly showed in my face. I’m glad we had another photo taken this year. Thank you so much Claire. What a beautiful gracious lady you are. I base that statement on seeing many gracious acts that I saw you make over the convention period. See I’m watching when you least ever expect it………………….. This is the super strong Bent Ink-linations representative at Convention 2011! 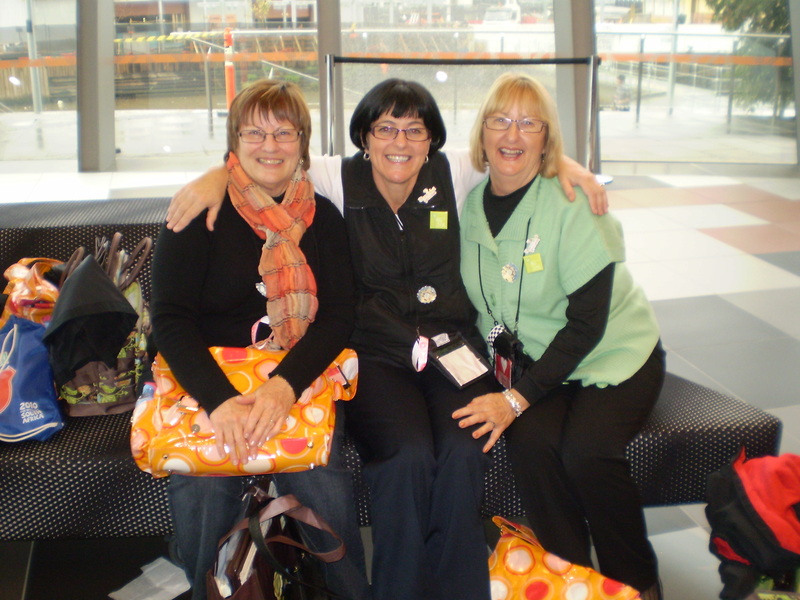 Myself, Therese (Tamworth) and Sue (Casino). This photograph was taken when we registered on Thursday morning, just prior to meeting the amazing Raj. Raj was the best barrista in the whole of Melbourne and he was waiting each morning with our coffee at the convention centre. He is such a sensational barrista that he made Sue and Therese’s coffee for them at Melbourne airport when they jetted out for varying destinations! Beat that for hospitality! Also, note the gorgeous convention bag this year. It was the best accessory a girl could ask for. Held all manner of stuff with pockets galore. Well done Stampin’ Up! Speaking of hosptiality………..Melbourne as a city was not all that hospitable weather wise. I’m sure that there are lovely spots to visit and coffee shops to sup at and sensational restaurants in which to dine , but how do you manoevre around that city with the climate you have? I truy admire Melbournians. Well done! 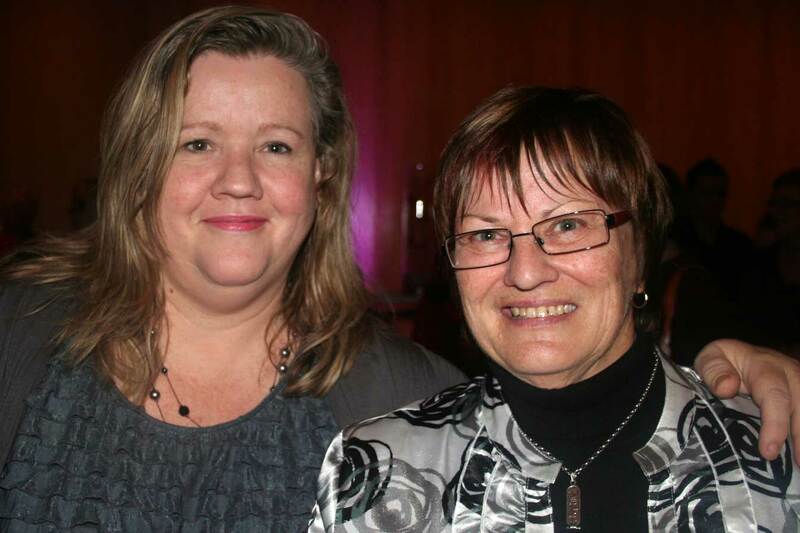 One of the downlines with me was the lovely Miss Therese from Tamworth. Miss T is a crazy Geelong Cats supporter and guess who was playing almost next door to where we weree staying???? Try as she may tickets were unobtainable so we had to suffer watching the game on the tele. For the records the Cats did win…….just. 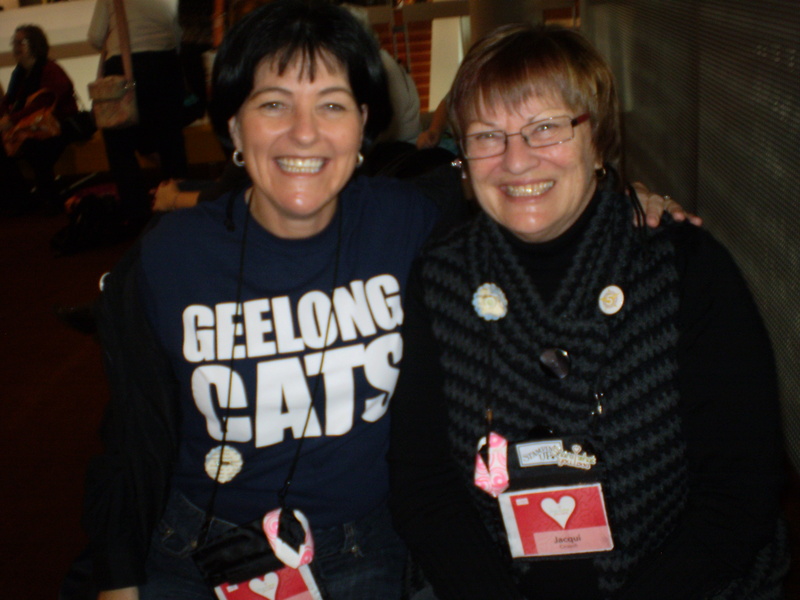 It truly made Miss T’s trip and so had to wear her Cats T shirt the next day to convention. What girl doesn’t like a shopping spree? What better place to shop than Memento Mall at Convention. 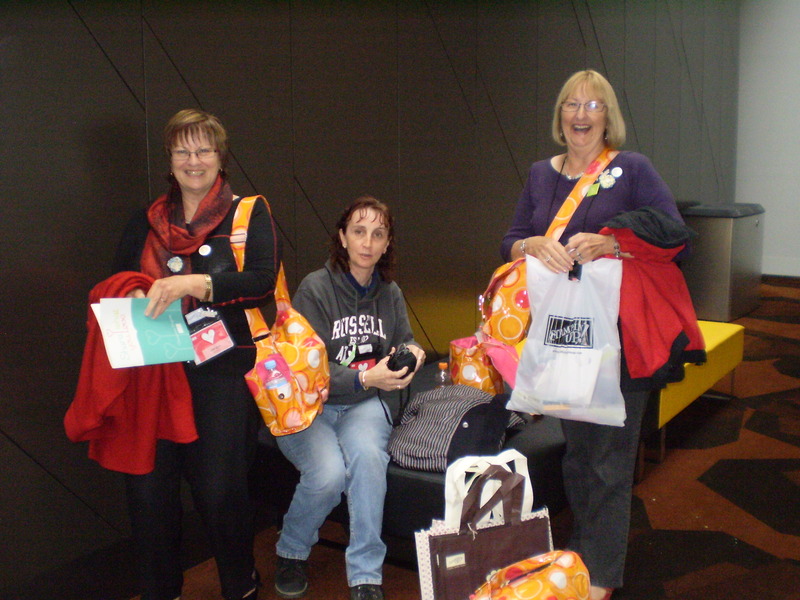 Here Sue, Annette and myself go through our shopping bags. By the look on Annette’s face it appears that her bank manager may be calling her very shortly. Sue and I being the seasoned shoppers that we are hide our fears well. Our final day at convention. 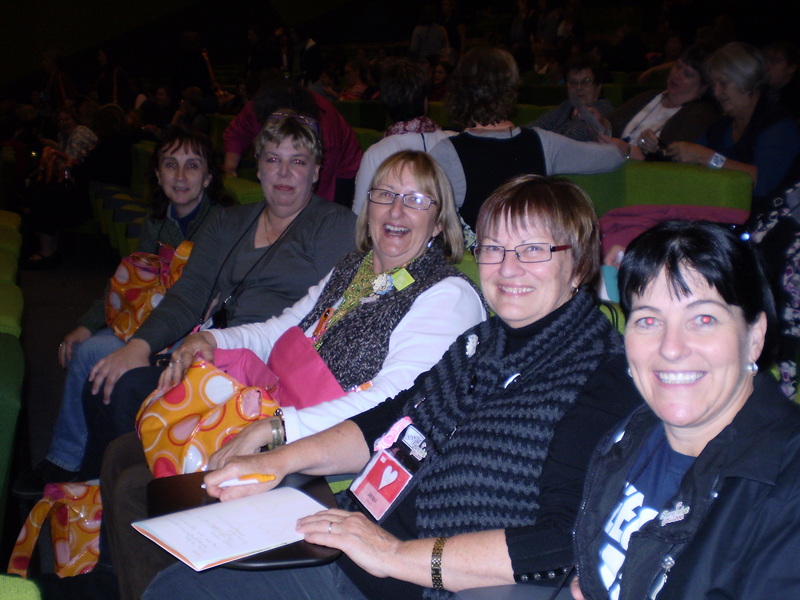 Therese, myself, Sue (Casino), Maggie Mathern (Geelong) and her guest Annette. Come back again and check out some new techniques we saw. I’m off to create!